One surprising thing about cooking through the alphabet has been realizing that I am not the only adult who hasn’t eaten some of the new foods we are introducing to the children. This week was no exception. J was our letter of the week, and the Mexican potato, Jicama, was our food of the week. Jicama is pronounced hee-cama in Spanish but around here you will generally hear it pronounced with a short I as in “hiccup”. Jicama in its raw form is slightly sweet and has a faint apple taste to it. I also think it taste a little like dirt, however, one of my friends informed me the proper terminology for that dirt taste was “earthy”. Okay, it is a little earthy, but this is probably due to the fact that it is a tuber and actually grows in the ground. It doesn’t make the top of the list as far as my favorite French fries go, but if you are looking for a French fry with lower carbs, or something other than the good ol’ Idaho potato standby, then jicama fits that bill. When comparing equal amounts of Jicama to the potato, jicama has less carbohydrates but a lot more fiber. Also, all the recipes I looked at were for baking the fries, which makes them a healthier choice than deep frying. My favorite dish using the jicama was the slaw. 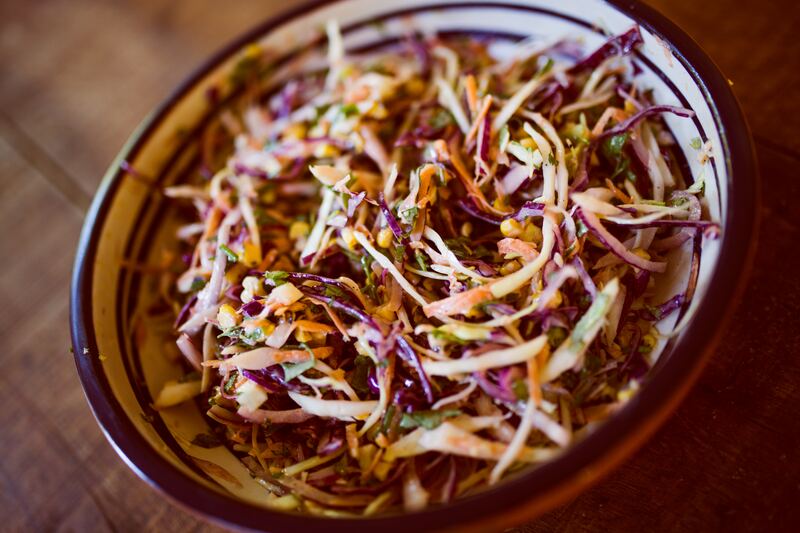 Meaning just slaw–not coleslaw. I didn’t use any cabbage. Instead I used apples, carrots, and jicama to give it the needed crunch. I also added some Brussels sprouts I had on hand. I found a recipe online for a spicy vinegar slaw dressing. Then I remembered I don’t like my coleslaw with a vinegar-based dressing so decided to make a mayo-based dressing just by adding the spicy vinegar dressing into mayonnaise. This made a delicious creamy slaw just the way I like it. And I must say the chili paste and cayenne pepper in the dressing really kicked it up a notch! I had fun with jicama this week. Many of my friends have been the recipients of all the dishes I have made so far while cooking through the alphabet, so I also wanted them to experience jicama. I shared the raw jicama with everyone: my coworkers at my dental office, my housemates, my neighbor and his son, my friends, and a bunch of rock climbing instructors at the YMCA. I explained what it was, and where it came from, and almost all of them liked it, including the teenage son of my neighbor! Now the next time someone asks any of us if we are familiar with jicama, all of us can surprise them with a resounding “yes”!